I love rituals although I rarely adhere to them. The current one I am going with: wake up, resist looking at my phone, brush my teeth, scrape my tongue, wash my face with either CeraVe or baking soda, moisturize with Linne facial oil, and apply Dr. Hauschka Summer Impressions Bronze Fluid. If I'm feeling ambitious I will make yogurt with fruit and honey or do some stretching. I go to Variety every morning before work for the best iced coffee in town. My art career has taken many different forms, but I would say what unites them is creating physical experiences that connect people to their own bodies and the “communal body.” This has taken many forms: my series Cinema 16 or my sound choreography at BAM, We of Me. These ideas are influenced by the traditions of social sculpture, happenings, séances, and rituals, among other things. I use film, sound, performance, sculpture, and photography as a launching point to explore genre, the psycho sexual, the fragmented body, gender, and ritual. For BAM, I handmade hairbrushes filled with microphones and choreographed a one-hour sound piece with 20 male performers. In the middle, my collaborator Brian Chase, drummer for the Yeah Yeah Yeahs, and I did a live mix in the middle. This piece was so much about the collective experience of listening, how sound affects our bodies, how touch and watching people being touched [affects our bodies]—there’s a very physical component. I work as the Director of Partnerships for Splacer, which means I get to talk to the most interesting people, organizations, collectives, and help them figure out how to reimagine space for any sort of creative activation. Social space and how people congregate in present time is always a driving force in my work. At Splacer I get to reimagine space as it relates to a variety of gatherings. Working with so many different types of people, I get to help conceptualize, execute, curate, and contribute to the culture of the site by programming really remarkable social gatherings. So far I’ve gotten to collaborate with everyone from the Criterion Collection to Van Alen Institute. Ultimately I am a creature of convenience, so I generally choose a handful of places that I commit to on and offline. These days I love Staud clothing based in LA, online shop LisaSaysGah, American Apparel, Trademark, and American Two Shot. So many of my friends have incredible style and they inspire me constantly: Sarah Kuhn, Gaby Ron, Jasmine Pasquill to name a few. I try to mix it up: a combination of 60s French New Wave, with 70s Southwest desert, beach girl, and old fashioned maiden. Cher has become somewhat of a style icon to me, which is birthed out of my obsession with extremely long hair, as evident in my art. I like to think of myself as pretty low maintenance but I am sure that's a total self distortion. In the last two years I have gotten really into skin care and do a facial every two months. I wash my face day and night with something super gentle and moisturize with Linné Botanical Skincare Facial Oil, which is all organic botanical products. Once a week I use the Christine Chin Hydration Mask (also when I fly). It's really important to keep hydrated especially in such a congested city like New York. 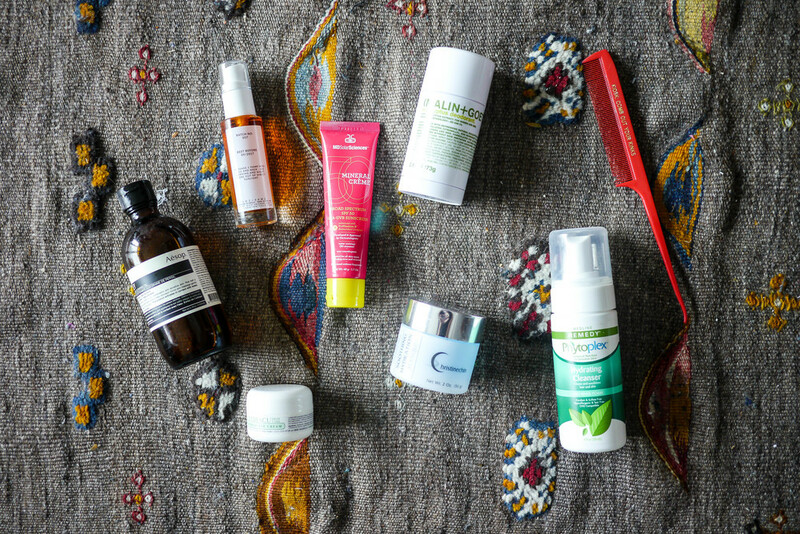 I also recommend Aesop Parsley Seed Facial Cleansing Oil, MD Solar Sciences Mineral Crème Broad Spectrum, Malin + Goetz Eucalyptus Deodorant, Medline Remedy Phytoplex Hydrating Cleansing Foam, and Mario Badescu Hyaluronic Eye Cream. I recommend Lancôme Le Stylo Waterproof Eyeliner, Maybelline Eye Studio Brow Drama, and Chanel Lip Color. I've been trying to grow out my hair for years and take it really seriously. Every morning I take Biotin and rub coconut oil into the ends of my hair. I wash it once a week with Pureology, which I actually learned about from Passerbuys! Also I try to do a conditioning treatment once a month and dust off the dead ends.